William and Kate were driven by Prince Andrew. The Queen and Prince Philip, Prince Charles and Camilla, and Prince Edward and Zara and Mike Tindall all attended as well. I believe Sophie is in the car with Edward and the Tindalls, although you can barely see her in just one photo. You can see photos of the arrivals at the Daily Mail. As a side note, I feel less bad about my typos in my headlines that I sometimes do (which you guys notify me of, thankfully) as the DM spelled family as “famiuly” in their URL. It’s still bad to have those typos, I just feel less bad knowing the DM also misses those things. Kate wore her brown Hobbs Celeste coat which she’s worn quite a bit since it’s debut in 2012. Kate also wore her navy blue Lock & Co Tiffany drop-brim hat which she debuted in March. In the photos, we can see a peek of Kate’s LK Bennett “Addison Printed Silk Dress” which she wore to host the Obamas in 2016, as well as her Cartier watch. I love that they are going to church. Kate looks much younger with this hat, like something she wore as a teen. It’s nice to see the Queen and especially Philip also attending.It’s surely not easy in this age, thinking of my own grandmother. I thought Kate looked younger also but I thought that perhaps it was because her makeup was lighter and fresher. Maybe this is how she applies it when she is off duty. I find her heavy makeup during public engagements can sometimes be harsh and aging. Kate looks great in large brimmed hats. I would love her to wear them more often. The Queen can really wear any color. This terracotta colour is truly lovely, anyway. I like this hat as well. It’s nice to see her in a proper hat versus a fascinator. Others are saying her outfit doesn’t work, but I actually think the contrasting colors are nice because she is usually so monochrome. I agree with other that the lighter make up is great and makes her look more youthful. I’ve always preferred the more natural look on Kate. Outfit seems a bit cobbled together. The dress and hat go together, I don’t think the coat does. And the dress is very long, does it now show at the bottom of the coat? I would love to be a fly on the wall In that family to see if Will and Kate really fit in or hold themselves aloof. Hope G & C get to play with kids their own age, these should be the friends they can always trust later on. The coat and hat are very heavy for August. IA I’m not sure where .you live, it’s been cold and wet in the UK throughout August. But I’ve not seen anyone wearing their winter coat. It’s a matter of principle… it’s summer. Layers, a scarf yes…winter coat..no! I wish we had full length shots just because I’m really curious how Kate’s outfit looks altogether. In my head I don’t really see it working so I would be interested to see more pics. Do Kate and William normally go to church when at Balmoral or is this in response to the tragedies in Spain? Or are they just visiting Balmoral? The Queen looks beautiful in rust and Prince Phillip – what a trooper. I think they only go to church when they’re at Balmoral visiting HM because she goes every Sunday, without fail. Other than that, they aren’t regular church attendees. I think it’s a pity that they don’t – William is the heir and it’s part of his responsibilities and he’ll be technically head of it, one day. They still go to church, without thr Queen when they are at home. For example, Kate and George were seen at a lantern lit service last December. I doubt they are very religious. They only go to church it seems when HM demands it. They don’t even go on Easter except this year. Kate suddenly decided to be Confirmed right before the wedding. Quite coincidental timing, right? No problem with that, but William being future Head of the Church and Defender of the Faith makes it a problem. That Hobbs coat seems to be Kate’s “go-to” coat for church? I do like the hat, but yet again, Kate’s got something new on so she can leave the house? Nice that others in the family accompanied The Queen and Prince Philip to church. All of these items are repeats. All of these items are repeats, which I believe I specified in my article. The hat is from March, the coat is from 2012, the dress is from 2016. I had issues with my internet connection yesterday so couldn’t read all of the post. That’s why I went straight to the comments section. Well ‘we’ may because we don’t have 500 coats in our wardrobe. But it’s surprising that she who does so few repeats, repeats this for Church so often. I suspect the presence of the Queen encourages her thrifty side instead of debuting something new. Do we ever see the Queen wearing a repeat? Marion the Queen does often repeat and she also changes things up because she has good dressers who can make variations. And if Kate is “showing her thrifty side in the presence of The Queen”? Then does that imply Kate does know it’s over the top to have a new outfit (or new accessories) for every engagement? I also remember reading somewhere that Charles only pays for new items if they are worn for “work”. She and Will have to pay for her non-working wardrobe (I may be wrong, but I assume family Sunday Church service is not considered work?) Maybe that helps explain why so many repeats for church? I can’t see William spending any of his money. Dude’s a cheapskate, he made the Middletons remortgage their house to pay for all the holidays they went on with him and paid for him or other people paid for him.. I figure Charles pays for it all! The Queen and the DoE look very spiffy! From what I can see of Kate’s outfit, I really like it, I like the blue and brown combo. The car pairings piqued my interest: the Cambridges with Andrew and the Tindalls with the Wessexes. I also like the color combo. Since we can’t see her feet, I’ll give her the benefit of the doubt she’s wearing shoes to pull it all together 🙂 It’s nice to see her in contrasting colors instead of monochrome. I’m always amazed that they don’t wear seat belts, which is supposed to be illegal. Fom what I can see only William seems to have his on. I don’t think the church is on the estate itself unless Crathie village is part of the estate? Makes no difference, after Diana they should remember the 1970’s advert we had here in the UK when seat belts were just coming it. ‘clunk click every trip’ …i.e. Never drive off without your seatbelt fastened. Statistically, almost one out of three road accidents happen within a mile/2kms of a motorist’s home. Private estate or not, they should wear their seatbelts. Oh, yeah, I agree, I’m just saying I wonder if Crathie is part of the estate thus they think they’re okay to not wear seatbelts? Whilst we don’t really see the dress, Kate wore this when the Obamas came for dinner. If you look back at those photos it is clear that on average Kate has made a real effort to improve her posture. The photos of her then are rounded shoulders, crotch clutching. She is definitely getting better on this front. Phew I’ve said something positive and genuine 😀. Queen Lauri, what do you think? I completely agree Birdy, Kate has made great strides in improving her posture. I’ve noticed that she does fidget with her hands when she’s not carrying a clutch but hopefully that too will improve with time. I know this year seems to have flown by but did I miss it turning fall?! These look like autumnal colors to me. Both for the Queen and Kate. The queen looks lovely tho. You know what would have been better than William and Kate riding with Andrew? Them riding with Charles and Camilla…. Sorry to go off-topic but there was a poster who insisted on mommy-shaming Princess Mary for going to Australia with Prince Frederik for a sailing tournament; well Princess Mary is in Denmark doing her royal duties. If you don’t like a royal that’s fine but we should probably judge them off of accurate information. Mary knew it would look bad. IMO the only thing she cares about–and this is how I feel about most royals–is her image. This is the woman who poses and preens while her son cries, or poses and preens while her daughter has holes in her shoes while she’s in Prada. And Frederik is off as usual having a great time getting wasted at VIP bars and clubs. Which is how he met Mary, and shagged her while he was dating someone else… What a winner! Almost makes me pity Mary since he clearly doesn’t respect her or their marriage. What 49 year old man goes off and parties late into the night like that? Yuck. He’s not 25 anymore, he’s a husband and father and future head of state getting blitzed on the taxpayer dime. If my husband behaved this way–and God knows he does it a lot–I would be furious. Mary looked really nice at her engagement today, though, whatever my feelings on her and Frederik. Whatever Ellie. Or how about she was never scheduled to go. I just wanted to make a point that people are so biased that they will twist anything to fit their narrative. She was posing and smiling just like Frederik but you only attack her parenting not his. 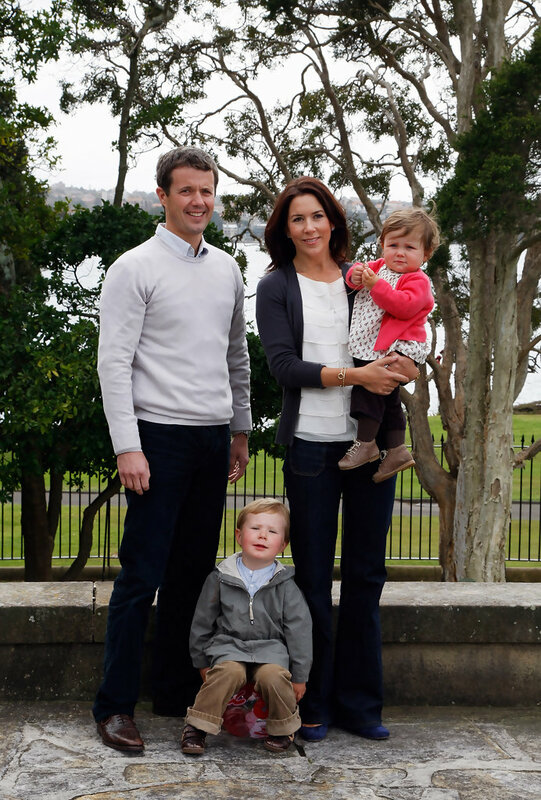 Frederik has nice shoes* as well but you insist on attacking another woman’s parenting. But whatever you just proved my point. *There’s absolutely nothing wrong with Josephine’s sandals and who cares if a growing child has worn down shoes. That’s typically an example of it being the child’s favorite pair so they wear them frequently. I’m not sure if you have children but it’s quite common. Oh my gosh Jessica, you’ve just reminded me of my goddaughter insisting on wearing her favourite dress when we went out. The dress dated back to the summer she turned 5. Roll on a couple of years and I’m remembering her insisting on wearing that dress in the middle of an Auckland winter and it was two sizes too small. She was very stubborn so I couldn’t change her mind, good thing I could fit a jumper in my bag for when she finally admitted she was cold! It could have been the same case with Josephine and she wanted to wear her favourite sandals? I love how much you love Mary and attack anyone who doesn’t. It’s kinda funny. Frederik seems more attuned to his kids but it’s not like he’s an involved parent jetting around going to bars in Australia and not working. He’s too busy having fun and being Peter Pan. I think he is majorly, majorly troubled due to his upbringing and I feel a bit sad for him. Alcohol problems don’t bode well for a stable person. Was this for me Ellie? Ok, so putting a baby in shoes with holes in them for a photo shoot is odd. I probably would have had the baby in bare feet or just socks if it was me and had arrived at the location for the shoot and discovered the holes. I’m really not sure what I think about Mary. I hope she is happy as living in a Scandinavian country is different from living in an Antipodean country, I’m a New Zelander and have lived in Sweden. Here is a picture from the Australian photo call. For what it’s worth the hole is at the toe, I don’t see a hole on the bottom of the shoe. Mary seems pretty modestly dressed at this photo call, so it does not look like she slaved over her appearance at the sacrifice of her daughter’s. It doesn’t jibe to me to claim that Mary is all about her image, and because of this did not go on the Australian trip, namely to project an image of a good parent, if that is the case wouldn’t she also care enough about her image to make sure her children looked impeccable for a photo call? Do you post under two names; because the original discussion I had was with another poster? I’m not going to continue this conversation any further. Also get a clue, no one was attacking you. You responded to me and I responded back. Just pointing out biases that I see in regards to some of the comments on this site. @Jessica lol No, this is the only name I post under. You’re terribly rude. “Whatever,” as you say! Don’t like Mary (like I don’t like most royals because they’re a-holes!). I don’t care if you do. I can’t like a woman who treats her kiddos the way she does (hand over Christian’s mouth when he’s having a temper tantrum and crying, holes in Isabella’s shoes, posing and preening while Vincent is crying as a recent example or her hand over his mouth, poor kid) or how self-importantly pompous she is. Which, granted, all royals are but she takes it to another level. Used to have a favorable opinion of her until I started reading about her. At this point, I no longer care. I am not a fan of Mary, however, I read that article and thought the same as you Jessica. Did you guys see the report that Kate was at the hospital last week? Do you think there is any truth to it? Possible pregnancy? No I have not. Which report is it? Do you can a link? Thank you for the link. Yeah, if it’s coming from Women’s Day and none of the British papers have picked it up, then I’d say it’s less than credible. Here it is. They are reporting based off of ‘Women’s Day’; not credible in my opinion. I don’t have a clue if this is true, but the caption of one photo, “the royals have a long-standing relationship with the royals”, made me laugh. Isn’t Women’s Day a tabloid and full of crap? Yes they are. 99.9% of what they write is completely false. If Catherine is pregnant, and an announcement is made this fall, perhaps coinciding with an engagement announcement from Harry, I think Catherine will receive a lot less press coverage of her pregnancy. Which she and William might think is a good thing! I remember seeing stuff about them saying Kate and Mary are both pregnant. If Kate is–I don’t think so but who knows–I wouldn’t be too surprised; she wants 3 kids, right? William doesn’t, but he also wasn’t ready for Charlotte’s pregnancy either, which made me think either a) she surprised him about it (I know so many women who have done this!) or b) whoops for both of ’em! If William is so opposed to a 3rd child, I wonder why he doesn’t get snipped? (rhetorical question, but I get the impression that he is satisfied with 2 kids and I don’t see him putting KM’s desire for a 3rd child over his contentment with 2). I agree that an engagement announcement from Harry will trump a 3rd Cambridge baby. But I would hope that IF there is a baby &/or engagement announcement forthcoming, neither will overshadow QEII & DoE’s 70th wedding anniversary. I’m sorry, but at this point a 3rd Cambridge baby screams ‘get out of work’ card to me. Has Kate visited her neighbours at a Grenfell Towers yet? Why can’t she do events that aren’t museum openings or meeting with rich folk? These people have had their lives forever altered and she still hasn’t taken a few hours of her not busy day to see them. Wasn’t she supposed to pick it up this year? I don’t think her numbers this year have reflected this at all. More lies. And I suspect that CQ being hired won’t change much either. Camilla hasn’t visited Grenfell either.